Union worker-owned cooperatives (union co-ops) offer a means to combat growing income and wealth inequality, create jobs, and recirculate money in the communities in which they are located. This article contributes to the academic literature about cooperative economics, worker ownership, and labor relations in two distinct ways. First, it relies on original author-collected data from interviews of those involved in establishing Our Harvest, an urban farm in Cincinnati, to discuss the issues involved in establishing a union co-op. Our Harvest was the first union co-op created because of a 2009 partnership to foster union co-ops in the United States. 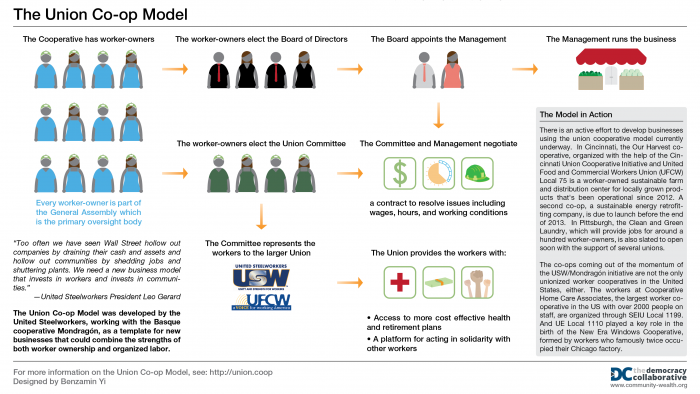 Second, the article addresses the labor law issues involved in establishing a union co-op. The issues include whether worker-owners are covered by the National Labor Relations Act, whether a co-op is required to bargain about worker ownership with the union representing its employees, whether a union co-op can require its employees to join a union, and how union co-ops can use interest-based collective bargaining. The article suggests ways that unions can legally support and finance union co-ops, provides an appendix of legal services, and includes tables to simply complex legal issues. At its best, the article will contribute to the scaling up of union co-ops and a concurrent revival of labor law that enables a more equitable economy for all. This entry was posted in Labor Laws/Legislation, Labor Unions, Worker Cooperatives on April 2, 2018 by afscme. This article evaluates worker-owned and unionized worker-owned cooperatives as alternatives to the conventional corporate structures for businesses in the United States. With their focus on democratic governance and shared ownership, worker-owned cooperatives offer an antidote to the extreme inequality of income and deterioration of working conditions that workers are experiencing. These are inequities for which corporate prioritization of executive compensation and shareholder enrichment are at least partly responsible. While questions have been raised concerning the sustainability of the cooperative form, two examples of large, well established cooperatives – Mondragon and Cooperative Home Care Associates – demonstrate how capitalization strategies, cooperative ecosystems, and strategic affiliations with unions can leverage resources to start and keep cooperative businesses functioning. The article also documents the growth of municipal and institutional support for the cooperative form of business ownership, and the role that the City University of New York’s Community Economic Development Law Clinic (CEDC) has played in supporting that movement domestically and internationally. That support has included developing curricula to build the capacity of worker cooperatives, participating in creating and sustaining the creation of a city-wide advocacy coalition, organizing annual conferences, and successfully working with local legislatures to increase funding for cooperatives. Law students in CEDC have gained skills of transactional lawyering, movement lawyering and coalition-building through their representation of individual worker cooperatives and their work with a city-wide advocacy coalition for cooperatives. Of particular note in the pedagogy of this representation are the advanced skills of integrative counseling and inclusive problem solving that assistance for complex actors requires. This entry was posted in Home Health Workers, Income Inequality/Gap, Labor Unions, Worker Cooperatives on June 6, 2016 by afscme. When maximizing profits isn’t the only goal, companies can actually work better. …. By prioritizing worker autonomy, co-ops provide more sustainable long-term employment, but not only because worker-owners seek to protect their own livelihoods. If a company runs into economic distress, Perotin says, co-ops are generally more adept at preserving jobs while planning longer-term adjustments to the firm’s operations, such as slowing down expansion to maintain current assets—whereas traditional corporations may pay less attention to strategic planning and simply shed jobs to tighten budgets…. This entry was posted in Worker Cooperatives on March 30, 2016 by afscme. Worker ownership and cooperatives will not succeed by competing on capitalism’s terms. This entry was posted in Worker Cooperatives on March 10, 2016 by afscme. ….The co-op, started in 2003, has helped dozens of inmates reduce their sentences and return to their communities. Of the 50 co-op members who have been released from prison in the past ten years, including Rodriguez, only two have gone back to prison, and one of them is again out on parole. The recidivism rate elsewhere in Puerto Rican prisons is over 50 percent per year according to Lymarie Nieves Plaza, director of marketing at a local credit union. Today, the co-op has 40 active members, in a prison with a population of roughly 300. And cooperative projects have sprung up in three other prisons throughout Puerto Rico, where they plan to make everything from children’s clothing to renewable energy products. …. Creating the co-op took several years and a change in the law. …. This entry was posted in Corrections, Worker Cooperatives on October 14, 2015 by afscme. Can workplace democracy pave the way to better conditions in low-wage industries? For home care aides, the results of one 30-year experiment are mixed. …. In a worker cooperative, every worker can own an equal share of the company (and its profits) and get a say in company decisions. Today, worker co-ops are growing in popularity in the U.S., both for people ideologically drawn to an equitable workplace and as a means for economically disadvantaged people to control their own destiny. But among worker cooperatives, Cooperative Home Care Associates (CHCA) is rare in for its size (employing over 2,000 workers), its longevity (currently in its 30th year), and its success (it has been profitable in all but three of those years). ….. This entry was posted in Home Health Workers, Worker Cooperatives on September 18, 2015 by afscme. Many people are also unaware that the labor movement has a long and committed history of involvement in co-op development. …. This entry was posted in Labor Unions, Organizing, Worker Cooperatives on July 14, 2015 by afscme. …. Through joining young people in organizing for education system democratization, we build the movement of worker cooperatives and the solidarity economy. We stand beside them in their fight for liberation; a struggle for freedom that will shape the paradigms and actions of everyone involved far beyond their time in school. This is a call to action for the solidarity economy and cooperative movement. We must organize, mobilize, and educate around a narrative of ownership and control, who benefits and who decides, with young people in the education system. If we want the world we are fighting and building for, then there must be no institution left behind (except the ones we don’t want i.e. prisons, militaries, etc.). These ideas and frames can connect us for much needed unity, clarity, and capacity. From the workplace to the school; solidarity! In our movement, we must have both. …. 1. Popular/political education on social and environmental justice issues, root causes, and movement building strategy. 2. Mobilizing young people to direct actions and other events in solidarity with other organizations and campaigns. 3. Publishing and distributing a zine with art, interviews, and articles from young people across MN. 4. Running a worker cooperative farm and teaching and engaging in systemic change strategies. This entry was posted in Education, Organizing, Worker Cooperatives on May 13, 2015 by afscme. …. A group of eminent and rising scholars were invited to address fundamental questions: What are the alternatives to the Wagner Act model of majority unions, workplace collective bargaining, and the current regime of social welfare provision on which it depends? What institutional structures could be created to provide dignity, opportunity, and protection to work? Rather than focusing on the current regime, the authors were challenged to explore alternatives and not to take anything for granted, including the existing divisions between or structures of labor law and employment law. ….The articles in this symposium collectively argue three important propositions. First, collective activism will be crucial to any revitalization of labor. Labor law reform should aspire to enable the organizing that is essential to effective collective activism. Each of the papers proposes a different way that law can either facilitate such organizing and activism or avoid thwarting it. Second, and related, institutional design matters a great deal to whether worker activism will occur and, if it does occur, whether it will be effective in improving working conditions. Third, legal rules should be crafted to facilitate collective worker action by making worker collectives sustainable and scalable institutions; by giving them crucial roles in existing legal regimes to empower worker voice in many important legal and political forums; by leveraging power at the local, state, and national level; and by thwarting efforts to use legal doctrines like preemption or legal bureaucracies like criminal justice to eviscerate organizing gains. The third step of the argument is where the authors strike out on four different but intersecting paths. The paths are: (1) empowering collectives, especially at the local level; (2) creating mechanisms to enhance leverage through local, national, and international frameworks; (3) improving access to information to enhance worker power; and (4) strengthening the institutional power of unions by protecting the ability of unions and worker collectives to fund their operations. The first two of these offer macro perspectives on how law facilitates and thwarts worker activism. The third and fourth examine the ways that law creates (or destroys) the institutional frameworks that empower workers to act collectively in organizing, in negotiating and administering agreements over conditions of employment, and in political action. …. Latin America’s “Third Left” Meets the U.S. Workplace: A Promising Direction for Worker Protection? This entry was posted in Collective Bargaining, Day Labor, Future of Unions, Globalization, Immigration, Labor Laws/Legislation, Labor Unions, Organizing, Worker Cooperatives on April 16, 2015 by afscme.